Women, how many times in your lives have you heard that God does not value you as a person? That the only job you can do at church is to work in the nursery or the kitchen? This book is about just a few of the women that God chose for His special purpose, and it was written in the Bible to show that He uses any man or woman that is willing to listen when He calls, and to step out in faith and obedience. They were no different than any woman in this day and age. God is calling each one of us, we just need to hear His call. 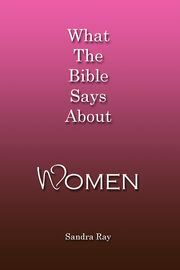 What The Bible Says About Women is available in all digital formats and soft cover edition, in both regular and Large Print.